While Apple Watch will enhance many aspects of everyday life, its Killer App may just be a significant extension in life itself! Over the past five years, Apple has hired over two dozen of the foremost health experts in the world. This World Class team has been assigned with the task of transforming the way all of us monitor and maintain our health. I’m convinced that in five years, we will all look back at this month’s revolutionary product release as the most significant improvement in life expectancy and modern medicine in the past 50 years. When the device launches, it will contain apps and sensors to monitor our daily activity. The Apple Watch will immediately improve your workouts and help you reach your fitness goals. But this is just the beginning. Once the Apple Watch has been unleashed upon the Apple development community, mindboggling new apps will be created that revolutionize modern medicine. Sharing critical information from the Apple Watch’s monitors and sensors will help doctors detect illnesses before they happen. As the Apple Watch user base expands exponentially, a treasure trove of data and research will be created on a scale once thought impossible. Realistically, these groundbreaking improvements in health management should easily increase the life expectancy of people in the United States by 5 percent. This would mean an average increase in life expectancy of 3.8 years for men and 4years for women. If I’m right, the question won’t be whether you can afford an Apple Watch, but whether you can afford not to own one! Please share your thoughts and dreams on how you imagine Apple Watch improving the health of us all! In preparation for the Apple Watch launch on April 24th, Apple removed its fitness tracker offerings from its online and retail stores. Fitness trackers like the Jawbone UP, Nike+ Fuelband, and Fitbit deliver similar activity information as the Apple Watch. All devices track user movement throughout the day. 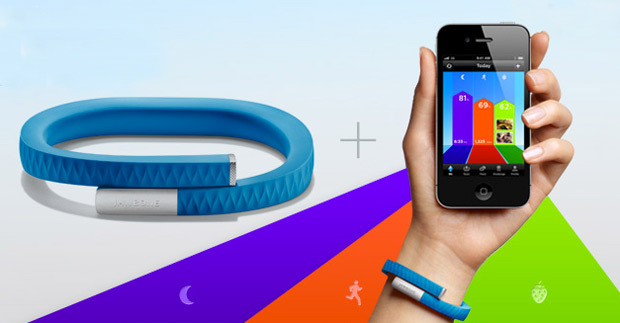 Fitness trackers are also able to offer sleep analysis due to their long battery life. Because of their long battery life and lower price point, fitness trackers will remain popular among consumers when the Apple Watch goes on sale. Apple’s decision to remove the devices from its stores is part of retail executive Angela Ahrendt’s goal of putting Apple’s products front and center by consolidating the amount of accessories in the stores. Apple released iOS 8.2 on March 9th with a slew of bug fixes and the new Apple Watch companion app. 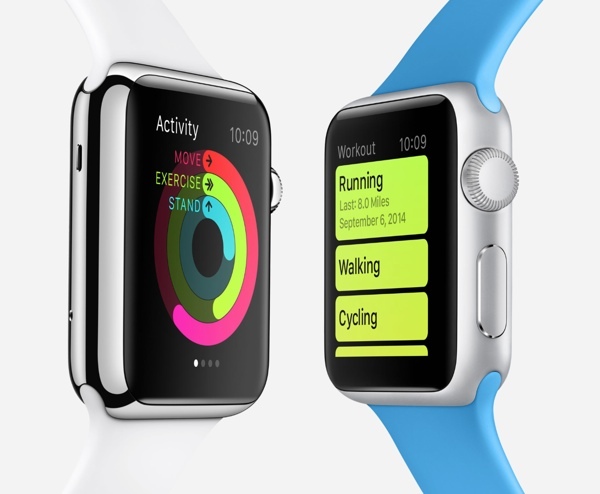 Although Apple revealed the Watch companion app, the previously announced Activity app did not appear in the update. An iOS developer discovered the app within the software and posted screenshots of the software. 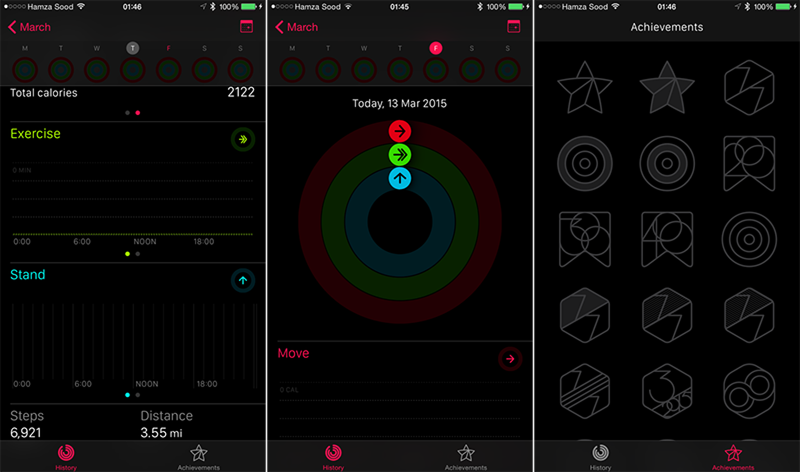 The Activity app does not show up on iPhone home screens until users pair an Apple Watch with iPhone. Once paired, the Apple Watch shares walking, exercise, and stand data with the iPhone so users can view the information in a more leisurely manner on their iPhone. A history tab shows past activity data on a calendar so users can compare their day to day performance. The app also includes an achievements tab that shows achievements users earn for being active. Activity is part of Apple’s strong health and fitness push for the Apple Watch and will inspire people to live healthier lives.